All those gas workers in the Merrimack Valley need a place to live. How about on a cruise ship? The Grand Celebration cruise ship made its way through the Palm Beach Inlet in 2017. Columbia Gas of Massachusetts has brought in hundreds of additional workers to help with the massive effort to restore natural gas service in the Merrimack Valley. And now the company has found a novel way to house that temporary workforce. The utility has rented a 1,900-passenger cruise ship and will relocate some workers from hotels if the company has to provide temporary housing for customers without heat. “We are confident it will help us meet the needs of our customers as restoration takes place over the coming weeks,” Columbia Gas said in a statement. The Grand Celebration ship began sailing to the Boston area early this week, with plans to stay here for about two months, its owner, Florida-based Bahamas Paradise Cruise Line, said in a statement. 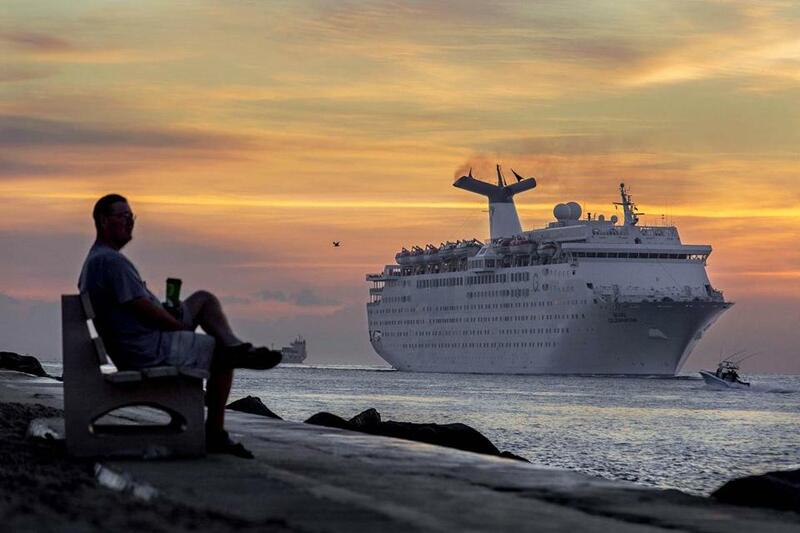 The cruise line said it had canceled dozens of upcoming tropical trips as a result. Officials from both companies could not immediately say where the 773-foot cruise ship will dock or when it will arrive. The ship has pools and hot tubs, a spa, theater, casino, nightclub, restaurants and bars, and a fitness center, according to the company’s website. Columbia Gas of Massachusetts’ massive effort to restore gas service to about 8,600 customers by Nov. 19 will involve some 3,000 workers, a mix of its own employees, others from its parent company NiSource Inc., and contractors, some of whom are being brought in from other parts of the country. About 1,300 of the workers will be focused on the construction side: installing new plastic pipes to replace about 45 miles of old, leak-prone cast iron and steel. The workforce includes plumbers and electricians to inspect appliances inside homes and businesses, translators, customer service representatives, and others to help manage operations. The cruise line company said it canceled 31 trips during October and November on the ship’s usual route — between the Port of Palm Beach and Grand Bahama Island. Customers can either get a full refund or rebook their trips and receive a $100 credit on board. The vessel was expected to resume normal operations in December. A smaller ship the company operates — the 1,680-passenger Grand Classica — will remain in operation and will run on the Grand Celebration’s schedule during October and November, according to a message on its website. “We will do our best to accommodate as many travelers as possible on remaining October and November sailings,” the website said. Last fall, the cruise line sent the same ship to help with hurricane relief efforts in St. Thomas, the Miami Herald reported. “The use of passenger ships has become common for this type of need,” Columbia Gas said.